When development teams begin to grow there is always the need to add organization on-top of your Source Control Management (SCM) system. Whether a full project management tool or a light weighted solution, this kind of tools improve communication and productivity. The goal is to control software development and the team behind it. Therefore I’m excluding tools like Basecamp, Asana... that focus more on team collaboration. Redmine (http://www.redmine.org/) is perhaps the most popular open source project management application, built on-top of the Ruby on Rails framework that allows it to be cross-platform and cross-database. 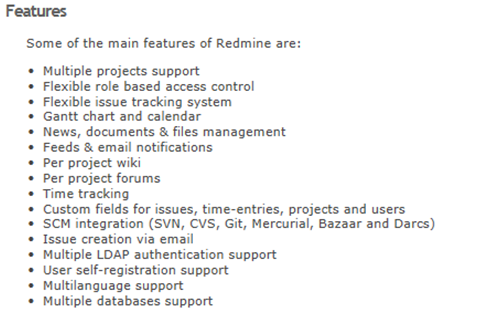 From the feature list bellow (image extracted from http://www.redmine.org/), the three most valuable features in my opinion are ‘Flexible issue tracking system’, ‘Gantt chart and calendar’ and ‘SCM integration’. This means that teams have the capability of centralizing all the projects together with the source code revisions and handle any issues using tickets. Together it can be read as: Traceability. There are some drawbacks but mostly operational: deploying and configuring Redmine requires expertise like DBA, shellscript and Ruby. Some team leaders don’t like the dependency it introduces in your SCM, almost like a DSL for comments and revisions. The time I used it I must praise the bitnami guys (https://bitnami.com/) for providing a ready to roll VM already installed with Redmine and MySQL. On the other hand there are GitHub and Bitbucket (among others). On the last years most of the SCM Systems migrated to the cloud. While big organizations tend to have on premises SCMs and can create value from Redmine, the new trend is to access such systems on the cloud. When searching for Agile tools I come across Bitbucket Cards (www.bitbucketcards.com), free for a limited number of users. 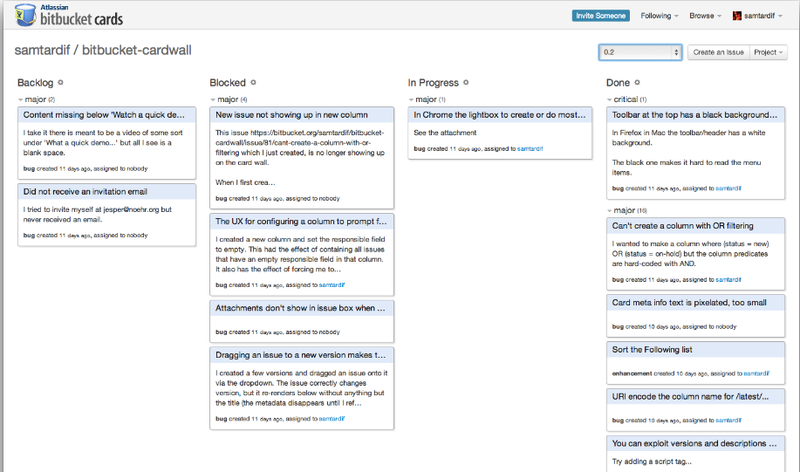 It’s a simple agile management tool that links your Bitbucket projects with a dashboard (card-wall) where you can create issues, associate a person responsible and track the progress on each iteration. Back on Bitbucket the team members can update issues on the issue tracker and even link them to code commits. Once again: Whether a full project management tool or a light weighted solution, this kind of tools improve communication and productivity. Share your thoughts on this subject! Published at DZone with permission of Filipe Bartolomeu, Pmp,itil,l6s . See the original article here.